In the proverbial "Battle of the Bulge", there are aisles and aisles of low-fat, low-carb, low-cal foods available to help us on our way. Hey, we can even find those little golden snack cakes in low-cal or fat-free versions. Pretty much every so-called "Bad" food has a "Good" counterpart... but are they really "good" after all? Sure, they will easily help you lower your calorie or fat gram intake - no problem there. But does simply lowering the intake # of any particular nutritional number feed our bodies with the nutrients it needs to function properly? In theory, a person could eat a "Mc-who knows what" sandwich (as long as you choose the Canadian bacon option instead of sausage or bacon) and OJ for breakfast, an entire box of "100-calorie packs" of mini chocolate cupcakes for lunch and a couple of lean-whatever frozen meals for dinner and still probably lose a few pounds. Their intake of calories, or fat grams, or whatever it is they're counting would probably be in the range they're aiming for to shed the pounds... but nutritionally speaking, they will have pretty much starved themselves all day. People today eat more than ever, but take in fewer nutrients. We are basically starving to death while we add inches to our waistline. Stop the dependence on processed, low-whatever foods and eat something real, something that hasn't been worked over in a lab or a factory. Try something that has been grown in the ground, with real sunshine and water... but without all the genetic-altering and pesticides. If your Great-Grandmother didn't eat it - maybe you shouldn't either. Aim for organic fruits and veggies. If you can find them, pick up organic, beans, rice, whole grain breads, cereals and crackers. Organic dairy products come from animals that have been treated correctly and not pumped full of antibiotics and growth hormones. Organic meat really does taste better than the stuff you buy in the mega-mart - yes, it does cost more, but maybe we would all be better off if we ate a little less of it anyway... think quality, not quantity. The only thing I can truly say Great-Grandma ate that we shouldn't is lard - yes, it is natural and non-hydrogenated - but check out the palm-oil shortening in the natural food aisle if you must - or better yet - just use butter (in moderation)! An organic orange, for instance, can have three times more nutrients than a standard orange. 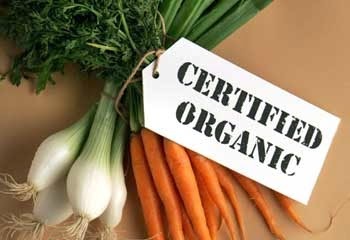 Organic foods are free of chemicals that can linger in your body. They're also not genetically modified in any way, which means an ear of corn is really just corn, not corn with fish genes spliced in to add some extra omega-3's (yes, omega-3's are great, but eat some wild-caught fish instead!). Let's stop over-eating yet starving our bodies of nutrients. Make it a point to switch as many of your fresh foods to organic as you can and throw away all those little packs of processed, nutrient free foods - they're not really helping your body in the long run. Why not try "feeding your family" instead of just "putting food on the table"? Good nutrition is highly underrated these days. I am a little late getting on the organic bandwagon but the more I read the more inclined I am to switch the way I shop for food, cleaning supplies, bath and beauty products, etc. I am getting there slowly but surely.